Why Not Teach the Spanish Civil War? Students won’t learn unless they are engaged — we have known this for a long time. The challenge is to get them engaged. As a high school Spanish teacher, it’s a problem I face every day. In my quest to cultivate in my students the passion I have for the language and cultures of the Spanish-speaking world, I have found that few topics work as well as the Spanish Civil War. When taught properly, the topic allows students not only to learn about a major historical event but to think, write, and talk about political, moral, and cultural questions that are as relevant today as they were 75 years ago. I have now participated twice in ALBA’s High School Teachers’ Institute on Ohio and the Spanish Civil War, co-sponsored by the Ohio Humanities Council and the Puffin Foundation. After trying to teach the war on my own, I quickly found I could answer very few of my students’ many questions. In the summer of 2010 I traveled to Oberlin College with a desire to learn everything there was to know so I could clear up my students’ doubts. Oh, how smart I would be! And, oh, how wrong I was! It didn’t take long for me to realize that the Spanish Civil War begs a multitude of questions that rarely lend themselves to easy answers. The ALBA institute frames the Spanish Civil War, among other things, as a story-telling problem. The war is comprised of a long series of historical events whose narrative can be told in many different ways. But every one of these versions necessarily involves editorial choice. Looking at photographs, documentaries, newsreels, interviews, letters, opinion pieces, literature, and other archival and historical material, the institute participants practice deciphering the ways that history is imposed on events. They then craft lessons in which their own students will be asked to engage with the same issues. Of course, the institute also addresses ways to provide students with the basic information they needed to begin fitting what they see and read into some kind of sociohistorical framework. Before my participation in the institute, my students regularly asked me about facts, names, terms and dates. After I re-tooled my instruction, their questions gave rise to lively, full-class debates about questions of defining and establishing justice and making peace with the past for the benefit of the future. My students had attained a working knowledge of facts, names, terms and dates — and they used Spanish vocabulary to do so — but they also wrestled with complex ethical and moral questions. The Spanish Civil War had grabbed my students’ attention because they could understand that it was an event in which a great deal was at stake: life, death, liberty, stability. Now, however; I had their attention and their curiosity to dig deeper. I also had materials that helped to tie a war in Spain 75 years ago to the lives of those who lived in surrounding Ohio cities; and to show the global reach of the conflict and its connections to other 20th century events, most notably World War II. We know from empirical research and our own experience that a sense of relevance is key to student engagement. I have observed that, when studying the Spanish Civil War, students begin to see Spanish — the entire discipline — as something of profound relevance to their lives. I believe that we must make the effort to bring authenticity to our lessons at all academic levels. We can do this by introducing our students to some of the fundamentals of Spanish history, including the Spanish Civil War, and choosing more authentic communicative contexts that reinforce principal details about that history. This will invite discussion and prepare students for more serious study at an earlier point along their educational journey. Instead of, as an example, a fictional account of a grandparent’s childhood as the basis for a lesson on the imperfect tense in Spanish II, why not use historical information from the Lincoln Brigade Archives to discuss the actual experience of a veteran? Why not make a family tree in introductory Spanish of some real Spaniards who fought in the war and who might be the focus of more study in later Spanish courses? Why not have advanced students read modern novel fragments related to the war and present a family tree of its principal players to younger students? 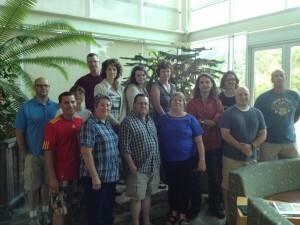 The participants in the 2012 ALBA/Puffin institute, co-sponsored by the Ohio Humanities Council. Photo Jack Shortlidge. These lessons will take no more class time than other textbook lessons they might replace, but they have the advantage of engaging students and fostering a love of something that we who teach them happen to love as well. We love the cultures of the Spanish-speaking world because of our real experiences with those cultures. It is our job to give our students that experience in the classroom to the best of our ability. Using the Spanish Civil War gives students an essential added benefit. Because it raises themes of ambiguity, deception, conflict, and discord, the Spanish Civil War challenges the imagination and interest of students in a chaotic teenage world. The topic also steers classroom discussions towards moral, ethical and historical questions that lack easy answers — questions that are students’ favorites, because they put them on an equal footing with their teacher. We as teachers may know more and be stronger thinkers, but it is our job to empower our students to raise issues we ourselves may not have seen, perspectives we may have missed and judgments that make us re-evaluate our own positions. Along the way, the students are inspired to learn the same vocabulary, writing and reading skills they need to learn, with less coaxing and greater rewards. And all this can be accomplished with ALBA as a powerful ally. Sean di Renzo teaches Spanish and chairs the Foreign Language Department at North Olmsted High School, near Cleveland, Ohio. 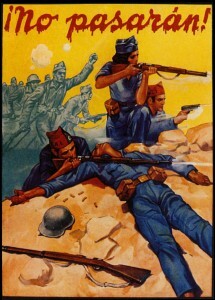 I was very pleased to read your article on teaching the Spanish Civil War and the excellent work by ALBA with the generous support of the Puffin Foundation.As a British historian living in Catalonia and studying the International Brigades in the Spanish landscape (see http://www.pdlhistoria.wordpress.com), my greatest pleasure is sharing the new discoveries that we are making through the ALBA archive and local knowledge. And if wishes were horses my dream would be to show younger people what is here! Students who are studying the Spanish Civil War to visit the actual places that are described in the letters and books. I would enjoy firstly showing some of the teachers who have taken the ALBA classes as to what is here and, by extension, to maybe later bring a small group of students with teachers (up to 8 with a self driver) to explore what is here. To meet Spanish students and to experience the real Spain. But of course, the first comment “This costs money!’ will rear its ugly head. And quite right too! But if the CPUSA could get 3,000 Americans to Spain aswell as medical aid too, would it not be possible for a group of teachers with ALBA to set up an educational Foundation using 501(c)(3)? You Yanks are well known for your philantropy and generosity, so could it be possible to extend this classwork to fieldwork in Spain itself over the summer holidays and engage young people in the subject? I know the places and I know places to stay in many parts of Spain where the International Brigadrs were. I would be very curious to talk with Sean and other teachers aswell as members of ALBA who would have the courage to organise an Educational Foundation to allow students from many backgrounds to see & experience another country and culture and to hear the voices speak from the pages of books and letters in the very same locations that they describe….. Personally, I learned about Spanish war when I was in high school in New Zealand. So I certainly know that the Spanish civil war is one of the most significant wars that took place in the last century. I definitely agree that the Spanish civil war should be taught in American high schools too. The Spanish Civil War is hardly mentioned in high school classrooms. I cannot help but wonder if it has to do with the fact that the United States government did not take what many consider to be the right and moral action. The United States attempted to stay out of the war and set an embargo on loyalist Spain. The governments actions did more harm to the antifascist side than good. It is touchy subject to bring up in school because of course the US doesn’t want its rising students to view the government as having been lazy in such an important matter. I believe it should be taught in high schools, it provides a perspective on world war II that many of us students do not have. I was one of those who learned nothing in my Cincinnati high school about the Spanish Civil war back in the anti-Red 1950s. And next to nothing in all my college history classes. Only socialists who I met would talk about it. When I went on Freedom Rides, my fellow White activists were all either Red or they were Quakers. These Red and others talked passionately about the idealism of their fathers, some of whom went to Spain to fight for the Public. So, I have taken a keen interest in the Spanish Civil war to understand their Cause. But as Spaniards have learned in a most difficult way, reforms and profound policy changes are just not pursued ardently by liberals. Upper class and business interests always trump the needs of working people in liberal governments. The US will not stop intervening until power is taken away from the 1%. This is exactly what the Socialists, Communists and Anarchists is Spain knew all to well before 1937. I do recommend viewing the many many hours of historical videos on the Spanish Civil War that are are youtube.com. Never let us forget Guernica.